Why Are Centipedes Coming Out Of My Sewer Drain? Are you finding centipedes in your sink drain? Brushing your teeth only to look down and see a centipede pop up through the drain? Since centipedes have a hard external skeleton (known as an exoskeleton). As a result, these types of bugs need a moist environment to survive so you will most always find them in damp areas outdoors as well as indoors. 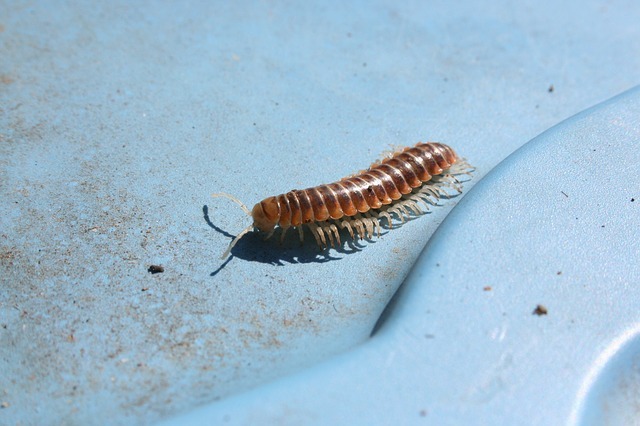 Why Are Centipedes In Your Drain? Now, you may be thinking that the centipedes are entering your pipes from the outside. And as that is certainly probable, what we've found is that the majority of centipedes found in drains actually come INTO the drain pipe via your sink drain. It's not just centipedes, the same is true for many other bugs. Now, most bugs are attracted to the moist conditions in your drain but if they fall through, fall down, they can't always get back up. And yes, they can drown. But - simply flushing the centipede down the drain won't really solve your problem. There are some simple steps that you can take if you notice that you have centipedes in your drains. Step One - Even though the majority of centipedes do not come in via an external crack it doesn't hurt to check it out. So, if you have access to your external drain or pipes - check to see if you can identify any cracks where these bugs might get in. Of course - if you can't locate your external drain pipes then call a professional plumber for help. Step Two - Check your drain pipes and gutters for stagnant water which gives centipedes an easy beeline into your home. If you find standing water - fix the problem if you can. As you already know - centipedes love dark and damp spots so your job then is to avoid giving them that. You can do that by clearing out any collection of wood, dead leaves or other debris from your property. You want to make sure that your sink drains are not clogged and that they are also free of any debris that may be blocking the flow of water. If you have had a leak in the area around your sink and that has caused any damage to pipes, flooring, floorboard, etc. You will want to make sure that you have replaced those materials or at the very least repaired them. You don't want any rotting wood which will only serve to attract more centipedes and other bugs. To prevent future incidents of centipedes invading your sink drains you want to keep your drains clean and free of any debris which may cause blockage. Does Baking Soda Kill Centipedes? Pour these down the drain (separately). Baking soda releases carbon dioxide bubbles which kills bugs. If you are having problems with centipedes in your sink drains, and you live in the Atlanta GA area, call at Atlantis Plumbing at 770-505-8570. We can help.